MOSCOW, March 17. /TASS/. 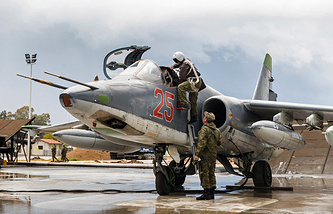 Russia's military operation in Syria cost 33 billion rubles (roughly $464 million) from the Defense Ministry’s budget for military drills and training, Vladimir Putin said Thursday. "The military operation in Syria, of course, required certain spending but the main part was from Defense Ministry’s resources - around 33 billion rubles. [This sum] was included in the ministry’s 2015 budget for holding drills and military training. We just redirected these resources for supporting the group in Syria," Putin said. "No one has invented a more effective way to perfect one’s military skills than in real combat actions. In this sense, military resources should better be used and spent in action than at the training range," the president added. According to the president, additional costs are required after the operation in Syria but they are justified in order not to pay a higher price in future. 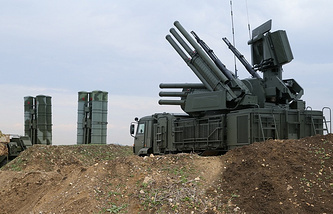 Putin also pointed out that Russia's weaponry has been successfully tested in combat in Syria and this experience will help improve the Russian Armed Forces. "The modern Russian weaponry has proved its worth in real combat conditions rather than at training ranges. This is the most rigorous test," Putin said, thanking all the workforce of the Russian defense industry. "This experience will help us make necessary adjustments, raise the efficiency and reliability of military hardware, develop new-generation weapons, improve the Russian Armed Forces and build up their combat capabilities," Putin said. "Life itself has showed that this is a guarantee of our country’s security," Putin said. Putin highly appreciated on Thursday the Russian military pilots’ operation in Syria. "Military pilots excellently accomplished it [their mission in Syria]," Putin said at a ceremony of handing in the Banner of the Russian Aerospace Force. The most complex and dangerous missions were accomplished by aircraft of Russia’s strategic and tactical aviation, Putin said. It is great honor and responsibility to serve in the Russian Aerospace Force, Putin said. "And the current generation worthily continues the military traditions of their predecessors. During the operation in Syria, you acted like true soldiers of Russia," the Russian president said. According to Putin, the Russian Aerospace Force is armed with modern weaponry, equipment, control and communications systems. "I expect you to act effectively and coherently and reliably guard the security of Russia and our people," Putin said. The efforts to learn to operate new military hardware are among the basic tasks for the Russian Aerospace Force, the Russian president said. "I’m confident you understand this well and will take maximum efforts to achieve the tasks assigned," the Russian president said. Putin stressed that Russia's main agenda is peaceful but the security of the country should be ensured as well. "The main agenda in Russia for today is, of course, peaceful. It includes working on development of the economy in uneasy conditions, maintaining and increasing the welfare of our people. However, we cannot solve any of these tasks without ensuring security, without building a combat-ready and effective army and navy," Putin said. He noted that "without this, the existence of sovereign independent Russia is impossible." "The tasks that were set for you have been fulfilled in general. Units and divisions are returning to places of their permanent deployment, returning home to Russia," the Russian president said addressing the servicemen who returned from Syria. "If necessary, Russia is capable of building up its forces just in a few hours to a scale that is appropriate for the developing situation, and using the whole arsenal of available capabilities," Putin said. "We would not want to do this, military escalation is not our choice," the Russian president added. "That is why we mainly hope for the common sense of all sides, for commitment of both the Syrian authorities and opposition to the peaceful process," he noted. 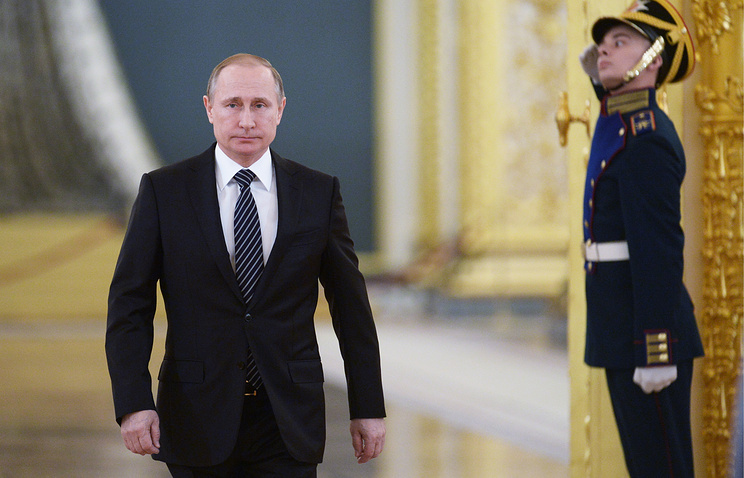 Putin has presented state awards to 17 Russian servicemen who took part in the counter-terrorism operation in Syria. Four officers were made Heroes of Russia. "Military pilots excellently accomplished it [their mission in Syria]," Putin said at the awards ceremony in the Kremlin. Putin said it is symbolic that the ceremony is taking place in the Hall of the Order of St. George in the Grand Kremlin Palace where "the history of Russia’s military glory is depicted, as well as its great military traditions and triumphs, the names of its valiant sons are immortalized." "Everything here is practically permeated by the victorious spirit of the Russian military," Putin concluded. Putin has confirmed that Russia’s task in Syria was struggle against terrorism and prevention of its expansion into Russian territory. "We identified the aims of the operation from the outset - support for the legitimate struggle of the Syrian army against terrorist groups," Putin noted. Putin said that Russia’s operation in Syria had been "expected to last for the period of offensive operations against terrorists." "It was stated outright that we are not going to get involved in the intra-Syrian conflict," Putin said. "It goes without saying that it is up to the Syrians to make a final decision and to determine the country’s future," Putin said. "Terrorism was the main target of our operation," he reiterated. "The struggle against international terrorism is right and fair. It is a war on the enemies of civilization, on those who breed barbarity and violence, who try to ruin the meaning and importance of the great spiritual humanistic values the world stands upon," Putin said. "The main purpose of our actions in Syria is to stop this terrible global evil, to prevent terrorism from spilling over to Russia." He is certain that Russia has displayed "its indisputable leadership, will power and responsibility." Putin reviewed some of the results of the operation in Syria. "Strenuous combat efforts turned the tide. We prevented the terrorist tumor from growing. 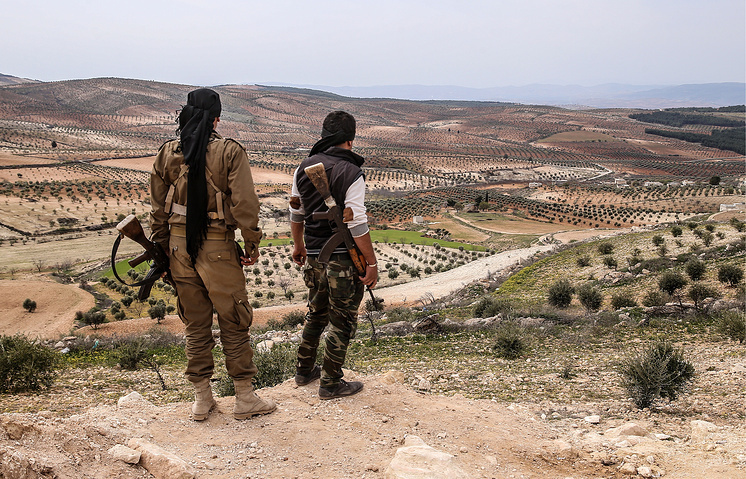 We destroyed the bandits’ shelters, their arms and ammunition depots and blocked the routes of oil smuggling that had been the main source of financing. We have carried out tremendous work to bolster Syria’s legitimate authorities and statehood," Putin said, adding that he made an unequivocal statement to that effect at the UN General Assembly session in September 2015. He believes that the operation in Syria proved very helpful in strengthening the Syrian armed forces. "The Syrian army now is not only capable of stopping the terrorists, but also of mounting successful offensive operations against them. 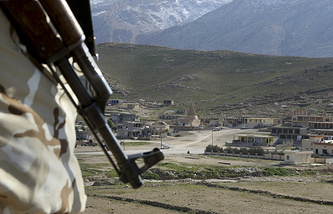 The Syrian army has taken the strategic initiative and it keeps regaining its land from terrorist groups," Putin said. The Russian president also praised the constructive position of his Syrian counterpart, Bashar Assad. "We see his restraint, sincere striving for peace and readiness for compromise and dialogue," Putin said. According to Putin, Russia has created conditions for the peace process in Syria, "opened the road to peace." "We have created conditions for the beginning of the peace process. We managed to establish constructive and positive cooperation with the US and a number of other countries, with responsible opposition forces inside Syria, which indeed want to stop the war and find the only possible political solution to the crisis. And it was you, Russia’s soldiers, who opened the road to peace," Putin said. 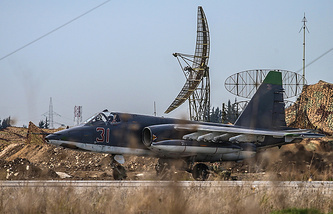 According to the president, the amount of work handled by Russian aircraft has dropped significantly after an agreement on cessation of hostilities between the Syrian government forces and the opposition was reached. The number of sorties decreased three times - from 60-80 to 20-30 per day. 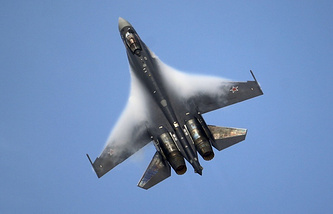 In this connection, the aviation group created earlier became redundant from the military point of view, Putin noted. "The decision on the withdrawal of a substantial part of our military personnel and equipment has been coordinated with Syrian President Bashar al-Assad who was informed in advance about our plans and supported them," Putin said. The head of state also noted that groups that violate ceasefire in Syria will automatically be excluded from the list of participants. "I note that if we register cases of ceasefire violations by any group, they will be automatically excluded by us from the list provided by the United States (of moderate opposition groups in Syria), naturally with all ensuring consequences," Putin said. He reminded that the joint statement of Russia and United States on ceasefire in Syria noted that fight will be continued against organizations recognized at terrorist by the United Nations. 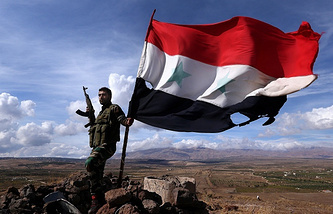 At the same time, Syrian government forces will stop military actions against armed groups of the Syrian opposition that confirmed their readiness for ceasefire. Putin noted that Russian forces that remained in Syria will control observance of ceasefire and ensure conditions for an inter-Syrian political dialogue.